Rocky Mountain National Park is enormous and takes considerable time to travel. This guide will help you locate its most photogenic sites. It's ideal for someone on a limited schedule. 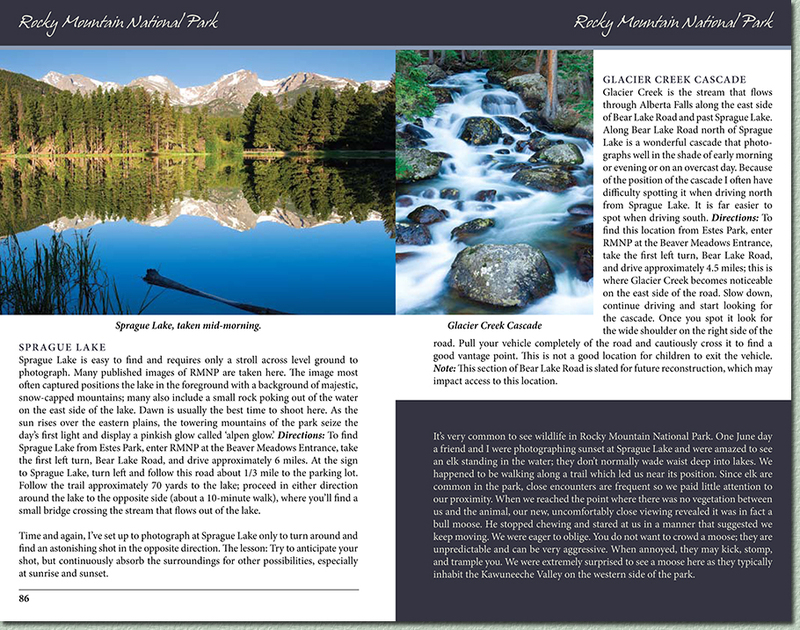 Below is pages 86 & 87 from the Rocky Mountain National Park section of the book. The following is a sample paragraph of one of the Rocky Mountain National Park shooting locations discussed. Bear Lake is the most popular destination and has the largest parking lot in Rocky Mountain National Park. Mornings, during summer, this parking lot fills to capacity; then shuttle buses transport people to and from the lake. Don’t let this discourage you from shooting Bear Lake as breathtaking scenery awaits. I advise photographing here at dawn; the lighting is best and you’ll avoid crowds. Note: Park rangers will ticket cars parked overnight without a permit. If you’re planning on arriving several hours before dawn and leaving your car in the parking lot, you should leave a note on your windshield informing park rangers that you haven’t parked overnight. Directions: To reach Bear Lake from Estes Park, enter RMNP at the Beaver Meadows Entrance; make the first left turn on Bear Lake Road. Continue on this winding, mountain road until it ends in the Bear Lake parking lot (about 9 miles). The lake is located about 100 yards from the parking lot and has a well-worn trail around it.